I'm just not feeling like myself lately, and I think it's because I can't find anything. We have warehoused all of our publications in a corner of my husband's building for years. (After 15 years it was a very large corner, I might add.) He retired last month and had to empty out a 5000 sq. foot space full of computer parts and equipment. Of course, this meant that Blackbird Designs had to move too. Barb and I picked a weekend in the middle of March, rented a truck and moved our patterns to a smaller warehouse. We sized down to about 800 square feet. Luckily we have very tall shelving...12 foot in fact. The heavy kind of shelving that holds lots of 25 lb. boxes of books. The day we picked was sunny and warm. Lovely....if you can call any day you have to move lovely. Rosy Morning, pictured above, arrived the day before our move, and I was able to ship out most of them before we packed up. This pattern is in your local cross stitch shop now. Unfortunately, I already have a correction note to let you know about. We really try hard to catch everything before we publish it....but sometimes we make a mistake. Stitch the bird body, positioned on the right side of the house, with GA Toasted Barley. Guess what just arrived in the quilt shops? Plum Sweet! It's our newest release from Moda fabrics. I can hardly wait to open my bundle and begin working with this line. The colors feel like spring, and after our winter I could use a bit of spring. 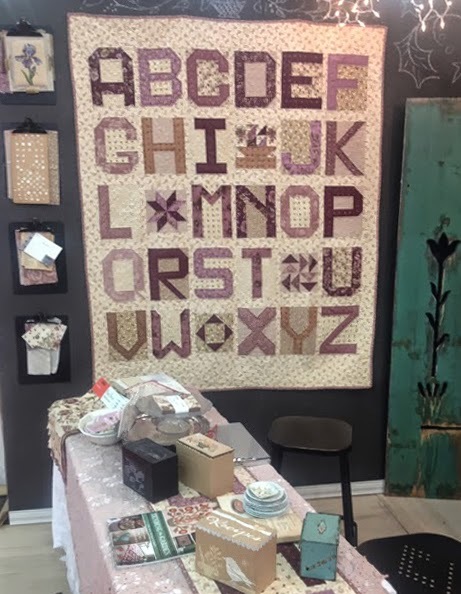 We used this fabric line to make the Alphabet Quilt from the Spell it With Fabric Blog Hop. If you didn't get a chance to download all of the patterns, check my posting of Feb. 26, 2014 for details. There is still time to get all of the patterns. We have another Reward of Merit we are getting ready to release next week. Below is a quick peek. Ugh!! Moving!! But glad you had a warm "rosy morning" to do it!! What a very sweet and beautiful pattern. Love the Plum Sweet also - I am planning out my Nature's Basket though..... wondering if I'll ever get caught up. Can't wait to see what you make with that bundle!! Happy Spring!! I love the Reward of Merit Pinkeep In Full Glory...I will be stitching this as soon as I can get it. Thanks for such beautiful patterns, books, fabric! I love the new charts as I have loved everything you have designed from years and years ago when I first discovered your exciting charts when i was living in Cyprus. 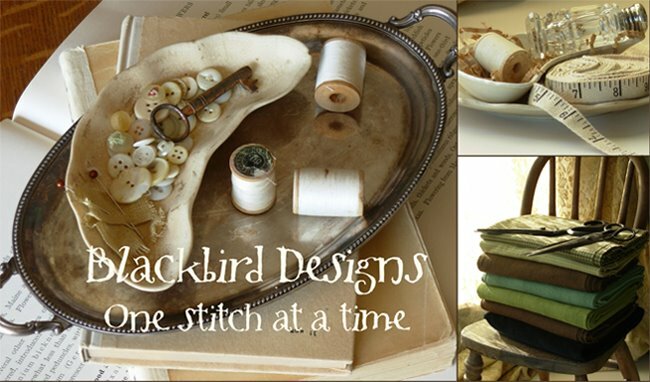 The new fabric line is as enticing as it's name. The plum blossom is adorning our tree like confetti at a wedding at the moment and I am already anticipating the sweet plums. 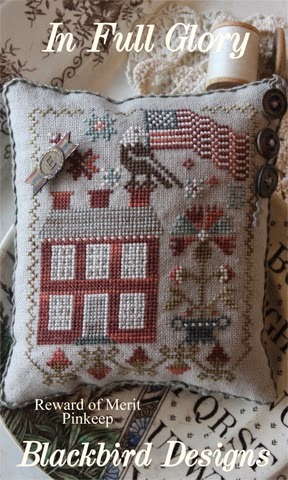 Love the gorgeous cross stitch and of course, Plum Sweet! Thanks for sharing. I love all your designs. I'm thinking of starting a sew along for " Away We Ride". I want it finished before Fall.I love the two new designs ! It is so nice and I want to stitch this one! I collect the reward of merit patterns too! I gave one as their reward in one of my quilting classes. Rosy morning is beautiful and I'm so glad I bought it from my local shop but I can't wait for In Full Glory! It just sings to my soul! Love your patterns! These will be additions to my stash looking forward to stitching them. So sorry you had to move but hoping it is working out okay for you. Unos diseños y telas maravillos. Espero que la mudanza este yendo muy bien. Buen fin de semana!! LOVE In Full Glory. Will be on the lookout for its release in the stores. But I wanted to thank you for your much earlier blog about your mini iris from Schreiner's. I ordered from them and after this grueling winter, all 10 are green and popping up. Ordering more soon! Mine are up too! Can hardly wait for them to bloom. I know you will really enjoy them! Each year you will have more. Love my Rosy Morning chart, can you tell me what color to stitch the alphabet in please..I do not see this symbol on the chart..Thanks. Stitch the alphabet with WDW Red Pear. 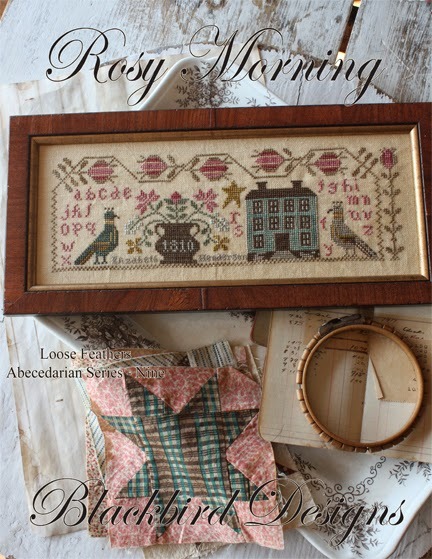 I love all of your cross stitch designs & just purchased Rosy Morning...i usually review the chart while i pull my colors & notice that there is a symbol for the alphabet but it is not listed with a color. I also saw the the top right border(second flower) it appears that the cover shows a break between 2 dots while the graph shows a side triangle between the dots...i will make the change on the bird on the right side of the house as stated above. Thanks & keep your amazing graphs coming! 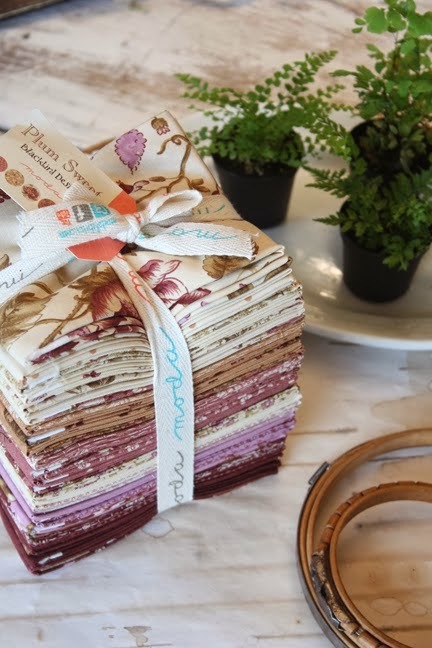 I have been looking at some of the Plum Street fabrics and wonder how they would work with the Meadow line. I've been wanting to do the Cosmos quilt but have decided that I want more contrast. Have the background pieces all purchased but want some color. I know that Country Sampler has assembled a fat pack of the plums--think that this line would work with Meadow? I love everything you do - cross stitch and quilts. I am looking for a quilt pattern I saw on your blog dated August 2011 and stitched by Nanci Allen Bowen. It is a patriotic quilt and she did everything by hand. It is beautiful. I would love to purchase the book if it is still available. Can you guide me? I was going to call you, but do not have a telephone number. When looking at your books on the internet, they do not show all the patterns inside. I would buy all the books just to look at the beautiful quilts, cross stitch and pictures. Thanks for anything you can do to help. God’s Blessings and keep creating such wonderful patterns. Thanks for all your efforts that you do to make this blog succeed. When you need to embrace an entire kitchen remodel, you will confront a major kitchen quandary. You should settle kitchen renovation manhattan on a choice about introducing the hardwood flooring first or the kitchen cupboards. Realize which alternative suits your circumstance and settle on an astute choice. Technology makes people more conscious and informative about the modern world.Technology gives people the whole world in their hand.Technology has developed different software and TV consumer apps much better than old days.Nowadays, technology also has developed most entertainment device,TV.Every day people are checking tv price tracker for their courtesy through technology. It's a good story to share experiences that I just know. I like your articles a lot and love everything you do and the most beautiful. Thank you for sharing your site information.